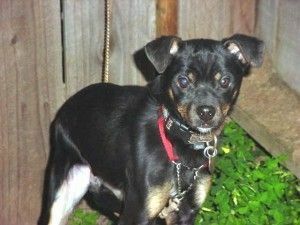 Lonnie is a curious and independent Terrier/Min Pin Mix male. He was born September 2009. He weighs 15 lbs. He is sort of “high strung” and active which makes him best suited for an adult home. He’s a little “macho” around other boys but doing well with both canine and feline foster siblings. Crate trained. Training contract required.